Many of my friends ask me about the brushes that I use to create different looks. I tell them about the ones I have and they seem pretty surprised that I have only a few. I am no "Makeup Guru" but I can assure you that to create simple, easy and daily wear looks, You dont need to have brushes!!. Yes, now calm down Baalikey and listen...ahem sorry read on! The funda, my friend, is simple - I use my fingers :-) and that works quite well for me. Let me tell you how I created this Green Eyes & Lilac Lips look without the help of Makeup brushes. a. After cleansing, I used an oil-free moisturizer on my face to prep up the skin for the base makeup. b. 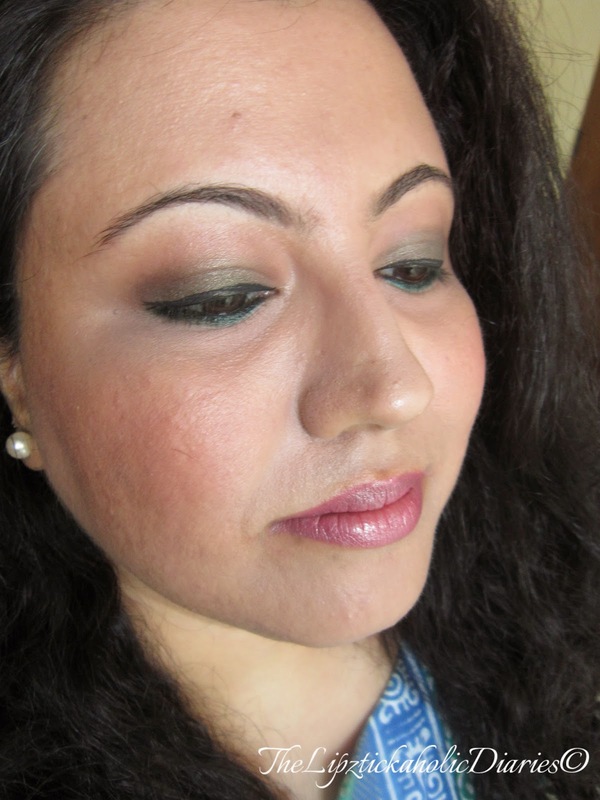 Next, I used the warmth of my fingers to blend the Lakme CC Cream (Bronze) into my skin. This has become my absolute favourite for daily wear. c. I used the Chambor Radiant Touch Up Concealer on the dark circles under my eyes. Now although this concealer comes with an attached brush tip at the end, I took some product out on the back of my hand and used the ring-finger of the other hand to spread and blend this product under my eyes. d. Next, to set the base, I used the Chanel Illuminating Powder. I used this with an old sponge I had. This is the tricky part – applying powder to your face without a brush. You have 2 options – You can either use a sponge / powder puff, or simply use a foundation that sets to a powder finish (Lakme Absolute Mousse is a good foundation that does that). 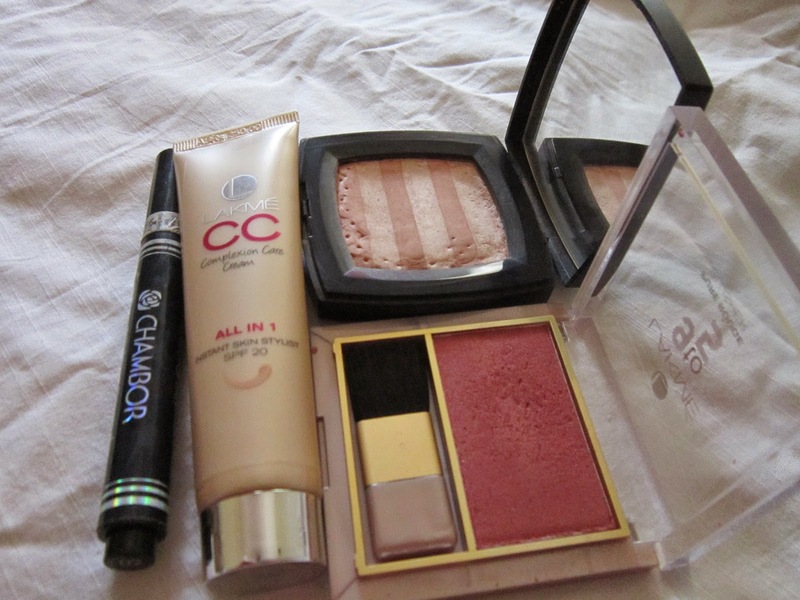 e. For blush, I used the Lakme Pure Rouge blush in Peach Affair. I lightly touched the blush palette with the middle 3 fingers of my hand and tapped them on my cheeks, where I wanted the blush to go. I blended the product by swiping in upward motions towards my temples and ears. Another option can be, to use Cheek stains instead of powder blushes. a. Revlon Shadow Links have small, easy to blend eye shadows that you can buy individually. I used the Khaki Green shade from this range on my eyes. I cleaned my fingers off the residue of the blush and used my ring finger to apply this shadow on my eyelids. Since the ring finger has the least pressure, it’s preferable to use it while swiping/applying the eye shadow. Your eyelids are saved from the tugging and pulling during application. b. For the crease area, I used the neutral brown shade from a local brand. I used my pointer finger to take this product & used ‘windshield wiper’ motions in the crease area, to blend the hard edges of the khaki green. c. Another tricky part is applying eyeliner without a teeny-tiny brush! No worries, I have a solution to that as well!! Use an eye kohl pencil instead. OK, so you have an eye pencil but it isn't the colour you want on your lash line? Then scribble with it on the back of your hand to make the tip a little blunt, so that you don't poke yourself in the eyes. 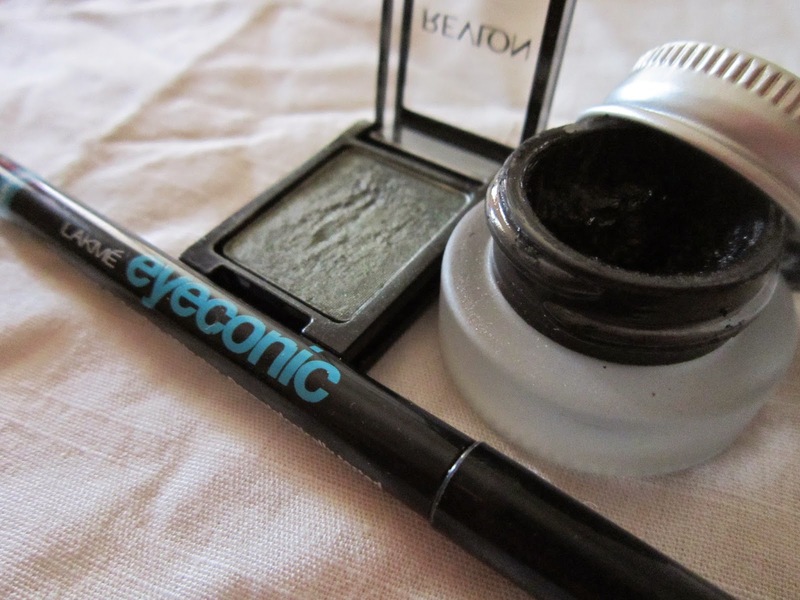 Once done, dip this pencil into gel eyeliner or liquid eyeliner (of your choice) and slowly line your eyes with it. Remember to stretch a little and hold, from the outer corners of your eyes. I did that and got a nice finish. a. The easiest part!! No brush required at all!! 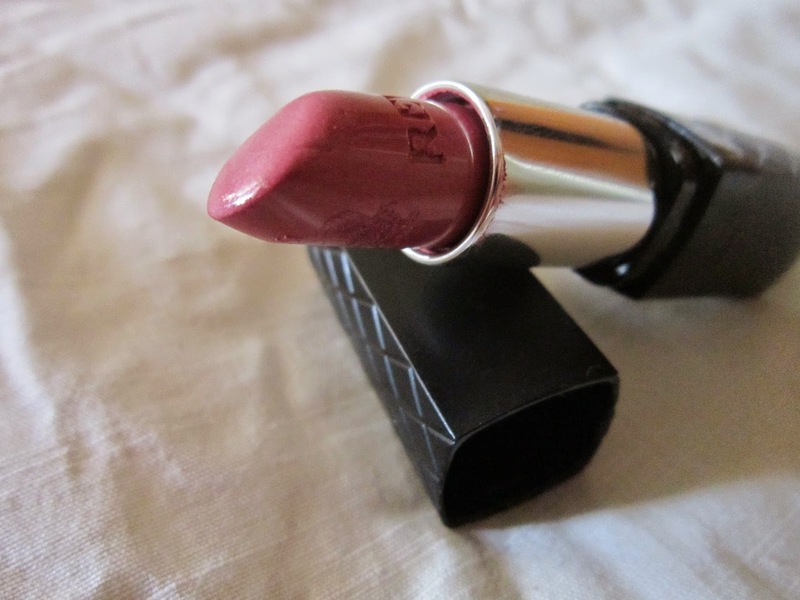 **hehehe** Swipe the lipstick bullet on your lips and purse your lips to evenly spread out the colour. With the edge of the bullet, sharpen the corners and outlines of your lips. DONE!!! I have used the Revlon Colorburst Lipstick in the shade 01 Lilac for this step. Hope this detailed step-by-step post helped some of you out. I’d like to part with my “2-rupees Gyan” (LOL nope I aint a KRK fan!). 1. Don’t be intimidated by makeup brushes and feel the need to own one for every step of your makeup. 2. If you still wish to own brushes, get 2 – A good foundation brush for a flawless finish & a good eye shadow blending brush. That’s all you need as Basics, my friend! CIAO!!! How about a video of it Neha?